One of the most important song forms in jazz is the blues. The blues was born out of the African slave trade in the United States. It came straight out of the oppression of the working fields, where the slaves combined African music traditions, spirituals, and African-American work songs. Often there was a “call and response” element and no strict form. The blues evolved, of course, and when early jazz was coming to fruition in the diverse port city of New Orleans, the blues was one of the key ingredients. The blues has taken on many forms over different genres and time periods. When it comes to jazz, the blues is essential to study, not only because it’s so influential in jazz, but because it’s a study in jazz harmony in itself. The blues is most commonly a 12 bar form, though you can find tunes with different variations. In today’s lesson, I’m going to walk you through 4 different important blues chord progressions. 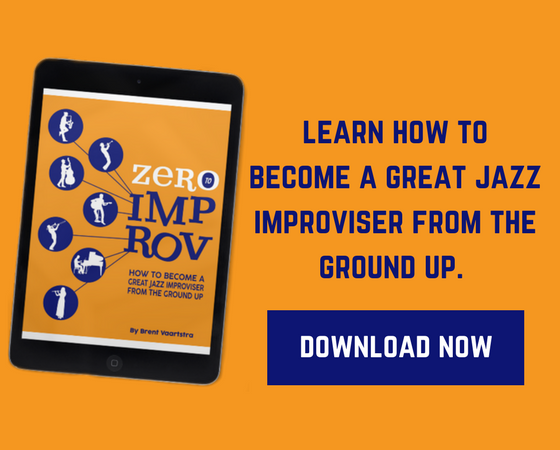 If you want to become a great jazz improviser, you have to understand jazz harmony. In other words, you could learn all of the licks and tricks you want, but if you don’t understand how jazz harmony works you won’t ever truly get it. That’s why it’s important to identify chord progressions and understand how they move. For example, the I chord is a dominant chord as well as the IV chord. 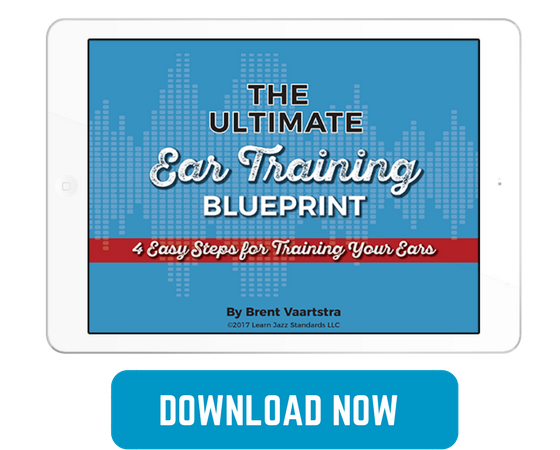 Let’s get started and start going over these important blues forms, starting with the Basic I7-IV7-V7. This blues form is a basic 12 bar blues, utilizing only three chords: the I7, IV7, and the V chord. I have this lead sheet in concert Bb, as this is a popular blues key in jazz. Take some time to memorize this chord progression, because this is important to know! If you play a chordal instrument such as piano or guitar, be sure you can comp through this and play all of the chords. If you are a horn player or other instrumentalist, be able to play the arpeggios. Now let’s go over the Basic Jazz Blues. 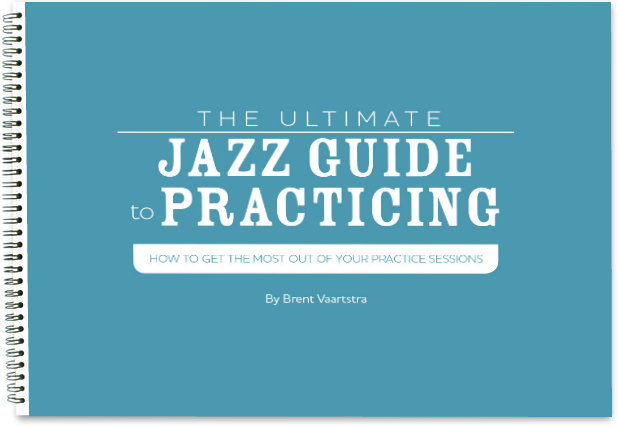 Jazz musicians have taken the Basic I7-IV7-V Blues and added more chord changes and variations to it. Many jazz blues standards are written with these changes. The differences in the chord changes start in bar 8. Instead of going to the V chord in bar 9, they play a ii-V into the I7 chord in bar 11. To bridge the gap from the Bb7 in bar 7, the dominant VI chord is added in bar 8. 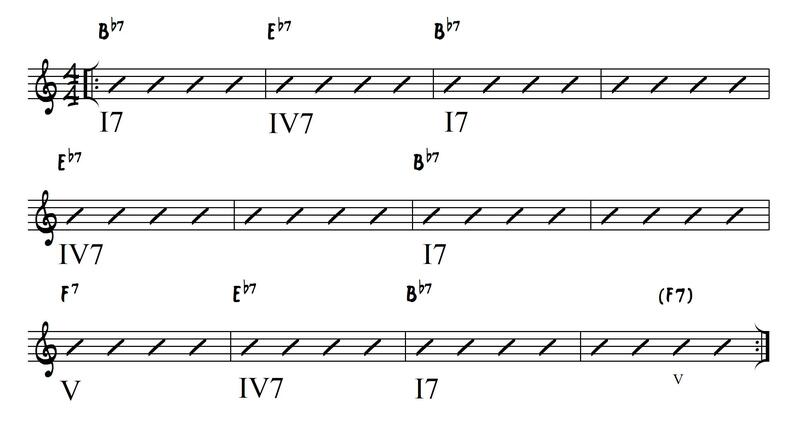 You may have noticed the chord in parenthesis in the Basic I7-IV-V Blues, and now you see it again in the Basic Jazz Blues (Cmin7-F7). This is what we call a turnaround. The blues is a short form that is repeated many times throughout the duration of a song. To get from the end back to the beginning, you can add a turnaround such as a ii-V to get back to the top. Now, jazz musicians get bored easily. They like to add even more changes into the blues. 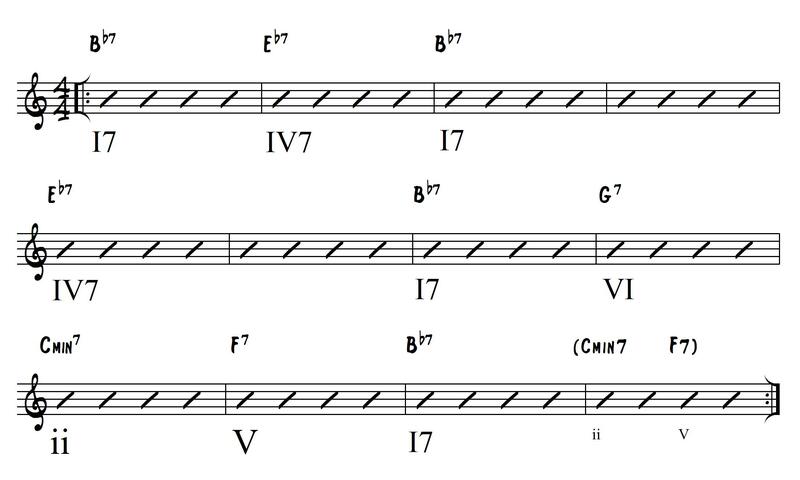 There are a lot of possibilities for adding and re-harmonizing this chord progression, but there are certain additions to the blues in particular that jazz musicians like to use. In bar 4, a ii-V of IV7 is added, meaning that you can perceive the Fmin7-Bb7 as a ii-V- into Eb7. This makes it easier to think about rather than relating these chords to the parent key center of Bb. 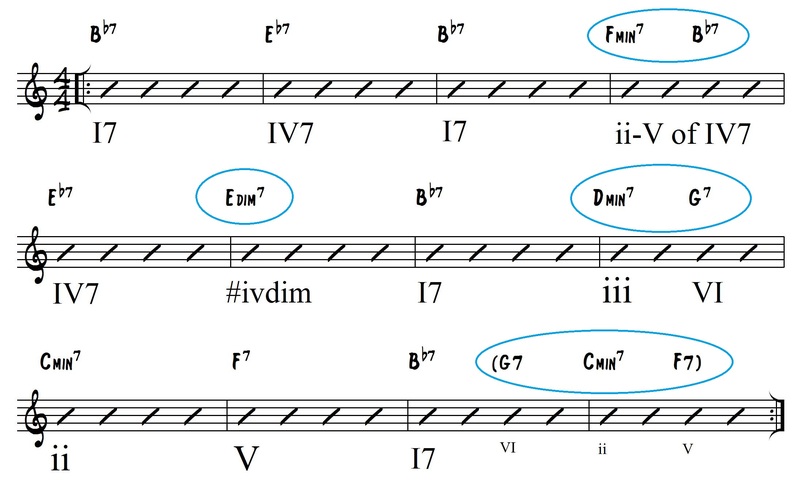 In bar 6, the #iv diminished is added. In bar 8, the iii chord is added with the VI. This adds some nice voice leading into the ii chord. The turnaround at the end now has a VI chord added in bar 11. Essentially, bars 11 and 12 are a I-VI-ii-V chord progression. There is one more kind of jazz blues you should know. It’s called a Bird Blues. Sometimes it’s also called a “Bebop Blues”. Bird refers to Charlie Parker, the iconic saxophonist who pioneered Bebop. If you don’t know who he is, be sure to look him up! His nickname was “Bird,” hence Bird blues, and he took the 12 bar blues and re-harmonized it to make his version of the blues. A good example is Blues for Alice. His version of the blues is straight out of the bebop tradition. There are lots of chord changes and reharmonized chords. On the next page, you’ll see a Bird Blues and I will circle the important blues chords so that you can see where he got them from. The ii-V of vi is a detour that leads into the ii-V of IV7. 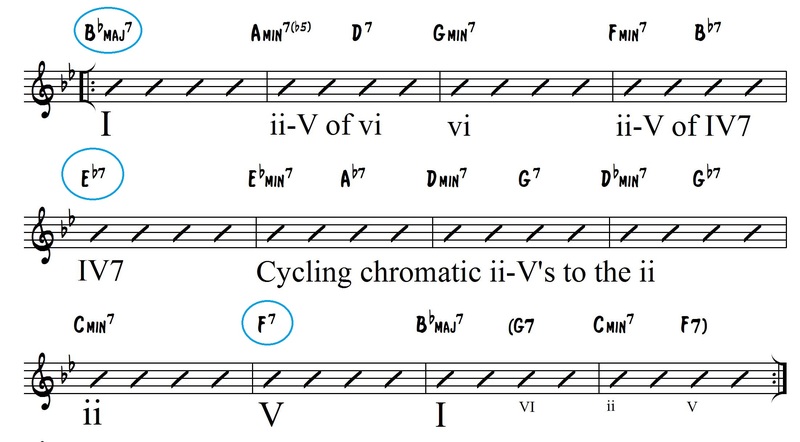 The series of cycling chromatic ii-V’s leads into the ii (Cmin7) which leads into the V (F7). Understanding the construction and harmonic movement of the blues is important, but then you need to start improvising over it. Vagabond Blues, is an etude (short solo) that uses the Basic Jazz Blues progression. Study this and learn some great jazz language! Blues in all 12 Keys is our play-along album that allows you to practice the blues in all 12 keys. This is a fantastic practice tool, and one of our favorite play-along albums we have. Previous articleWhat’s the True Meaning Behind Jazz Music? I'm a beginner. Please explain in the first dgm. where exactly is the 1-4-5 sequence? All I see is 1-4-1-4-1-5-4-1-5 Thanks. ..but thank you for the lesson! Is there a reason you placed this in Bb? Surely putting it in C would have made it more accessible for learning purposes? Hey, good question! Bb is a fairly common key as far as jazz blues goes. C could be acceptable too, but I find that the most common keys for blues in jazz are Bb, Eb, F, and G. C comes up as well. Thanks for the feedback!